I am so close to, but not quite, finished my last painting KEEPING WATCH of the 15 that will be in my solo exhibition, STUDY OF BLUE, opening June 30, 2011. You are going to have to wait – maybe Friday, depending on how my week goes. 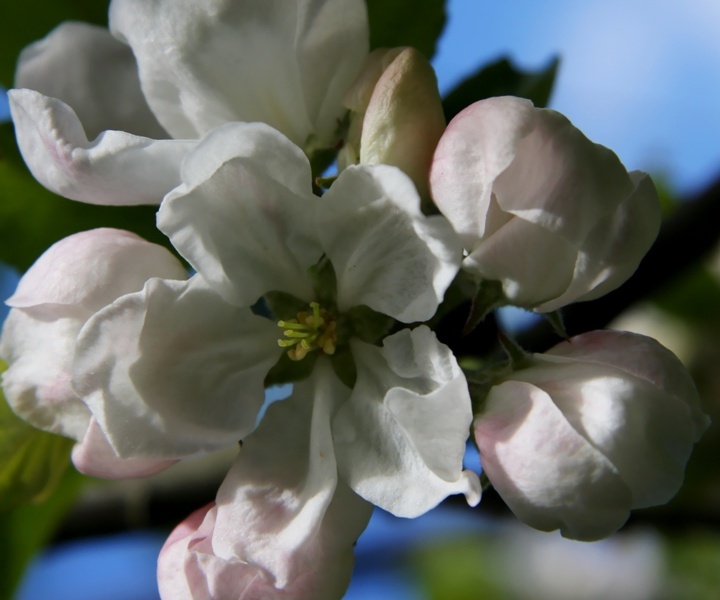 To sustain you until then, I have some lovely apple blossom photographs. until finally, they are dancing on the branch…. By the way, I had the most amazing Friday the 13th. 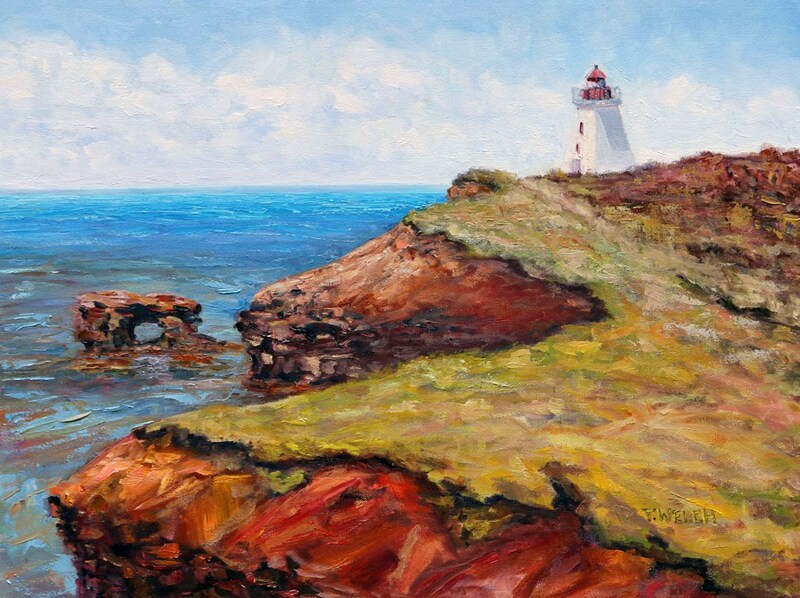 Two of my original oil paintings were sold in pre-sales and will be off to new homes July 27, 2011 at the close of my upcoming show. ORANGE SEA will be off to a collector in Victoria, B.C. Canada. HEAVY CLOUD will be off to a collector in the United States. May the pieces enrich and bless their new owner’s lives for years to come. Friday must be one of my good luck kinds of days! This now means that three of the fifteen paintings to be shown are already sold. A very good beginning – don’t you think? Sprout question: If you could choose anyone of the STUDY OF BLUE paintings to hang on your wall which would it be and why? 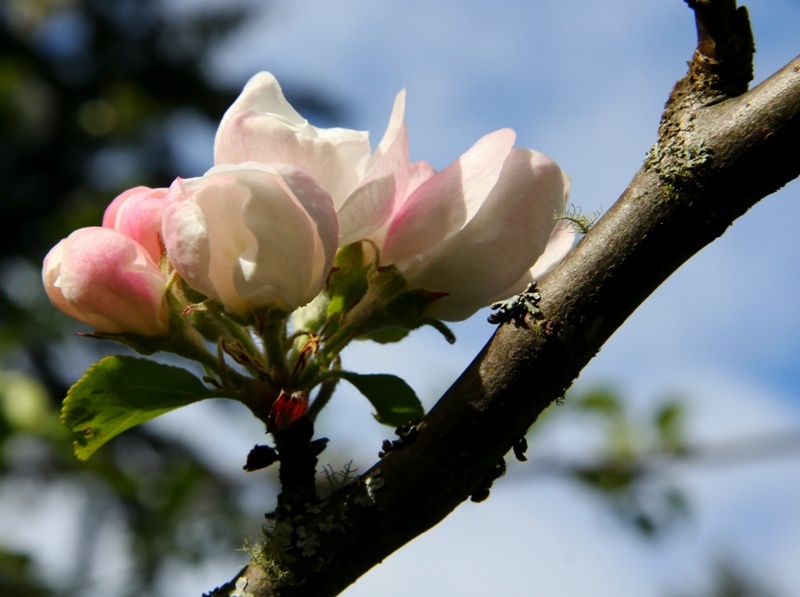 Terrill – I can’t believe you’ve already got apple blossoms! Man-o-man, we certainly have different weather. We’ve just barely got leaves budding on our apple tree, let alone blossoms! Your photographs are lovely, I can almost smell the blossoms from here. Sprout Question: If you could choose any one of the STUDY OF BLUE	painting to hang on your wall, which would it be and why? That’s easy: EAST POINT CLIFFS because I can readily picture myself sitting on the wind-whipped edge while drinking in the panoramic view with every pore of my being — body, mind, and spirit. Yes Laurie we are in a bit of a mild pocket here on the south west coast of Canada – but it is wet. They call it a rain forest for a reason. It has been far too soggy for me to finish planting the garden for the past two weeks. However, mid summer can create dry drought conditions as the ground doesn’t hold the moisture very well. EAST POINT CLIFFS for you Laurie. 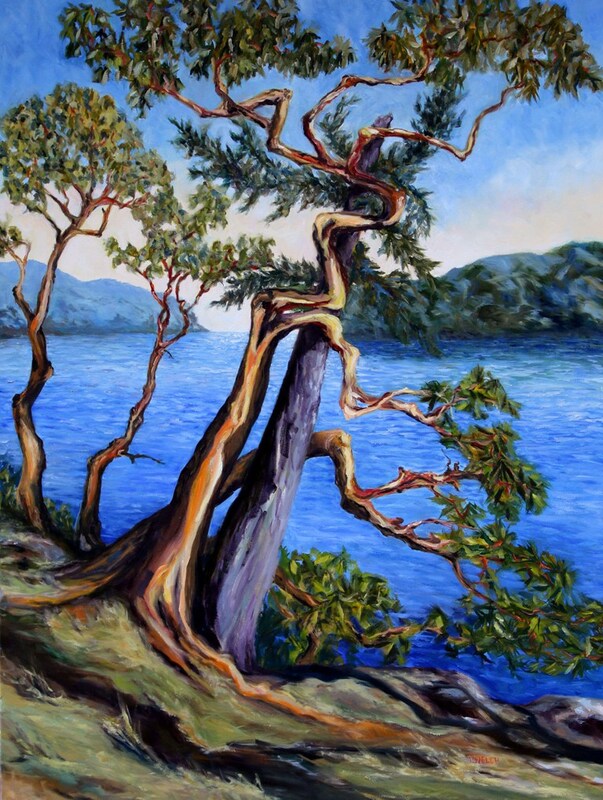 When you come visit sometime, we will have to allow enough time for a trip to Saturna Island to go and do just what you describe. The day I was there it was February with bright blue skies and wind whipping off the ocean clearing all debris from my being as it went. Wow ! Two paintings on the same day! I knew of the one, but had not seen info on the second sale! Congratulation! The apple blossoms are beautiful, ours here have come and gone, most likely already little orbs hanging from those same branches. Storm Coming or Breaking through would be my choices! Storm coming because I love the splash of waves, the energy. Breaking through because it reminds me of photographs that I have taken, and I like the mystery of what lies beyond! Yes Jeff two in one day. Makes an artist sing… and this artist you never want to hear sing so expect this shall not happen too often:) So your a bit ahead of us and Laurie is a bit behind when it comes to apple blossoms. Isn’t it amazing how things can be so much the same yet different? STORM COMING or BREAKING THROUGH for you Jeff. I can see you enjoying this contrast of high energy and the peace and reflective space of the mist in the trees on a quiet walk. Dear readers for the sprout question response we can more than one person choosing the same original for their wall. That is the beauty of window shopping at Creative Potager. Congratulations on your the sale of your paintings. That is great! 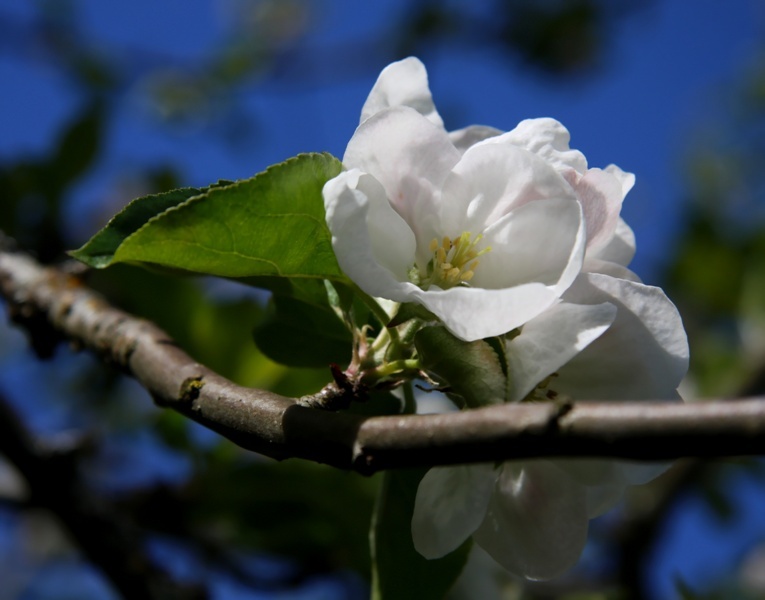 Apple blossoms are wonderful! You got some wonderful shots. Can almost smell them! What a tough sprout question. I looked and looked. Narrowed it to three: Breaking Through, Owl’s View and Winter Sun. Then looked again..yes, I think Winter Sun would be the choice for today as it is dark and pouring rain here and that glimmer of color and light just appeals. Thanks Sue. There is so many wonderful smells right now with all the spring flowers it is like being in a perfume shop but much better – except for those with allergies. Sue WINTER SUN is one of mom’s favourites too Sue. It is interesting because it is kind of a moody sunrise but the perfect sense of hope on a dark winter or rainy day. 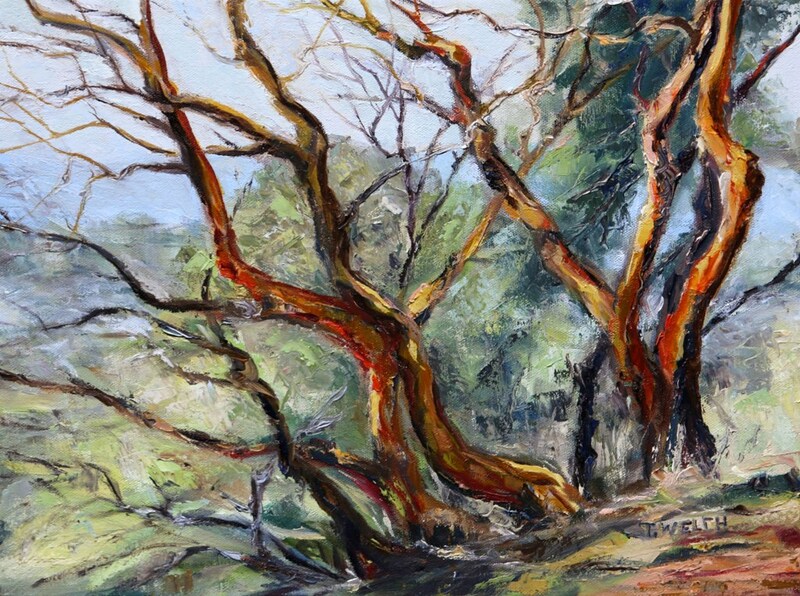 BREAKING THROUGH and OWL’S VIEW are quiet paintings that draw a person inward. Both would allow for a calming window of escape in a room. Sometimes this is just what is needed to finish off a reflective space. I can see these paintings in “the quiet room” of either a private home or a public space like a library, dentist or doctor’s office or a counselling or therapy room. Why? For me, it would be a reminder to always look for the patch of gold light–the positive in a time that may seem dire. Leanne that is exactly how I feel about HEAVY CLOUD – just that one small bit of light leading us to hope and possibility. Ooops, in my speed to answer your inspiring question, I forgot to congratulate you on the sale. Possibly another reason for my forgetting is in doing so I was also acknowledging the dream of hanging Heavy Cloud on my wall would remain a fantasy. Ah, well, you will continue to paint and my dream will eventually become a reality–when one of your lovely creations does grace one of my walls. Best of success with your show. Thanks Leanne, I am hoping if you may be able to come to the opening and have a glass of wine and nibbles on me while browsing the walls with a discerning eye:) It is always nice to have other creative friends come and celebrate. And as for your loss, you are so right Leanne – I shall continue to paint and another painting will draw you in and that time maybe you will be able lay claim to it and take it home. However, HEAVY CLOUD is still available as a print, or a card from redbubble. I know it is not the same as the energy that dances off original work but it is close. Just a thought… but I am more than happy to keep painting and wait to see that look on your face when you find the perfect one that then becomes yours. Thank you for the kind words and the reference/referral. I will head over and read the metaphor article this afternoon. I thought at a time of exams and term papers and in a season of change it was time for a reminder of just how we learn….Thank you for stopping by! It was my pleasure Patricia and enjoy the read. I love blossom photos – I particularly like the light in the 4th one that brings out the lovely pink colour 🙂 Sounds like not such a bad unlucky day last week! Helen you are so right about “not such a bad unlucky day last week.” I am still smiling. 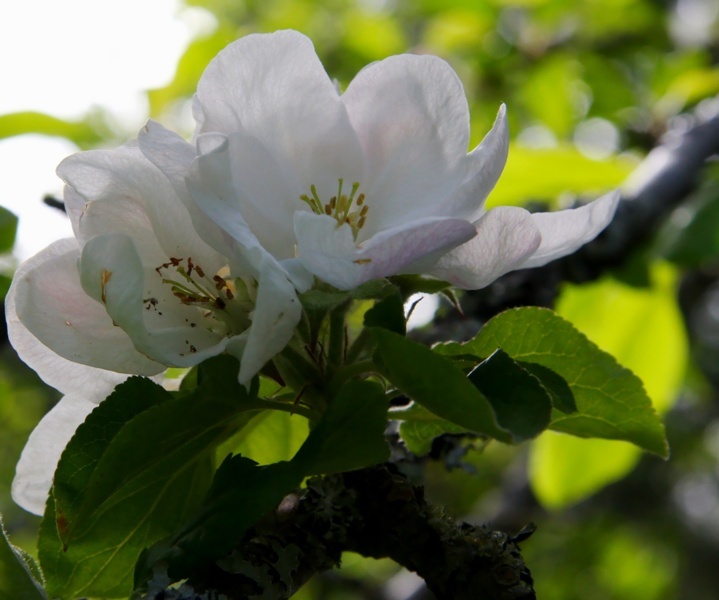 Glad that you had a moment to stop by and enjoy the apple blossoms. A great Daisy…. glad you have them now too. I too feel that excitement Daisy. I just added the last painting to my flickr folder but don’t tell anyone because I will post it for Friday (only those that are reading comments shall know… we shall see if anyone discovers it before Friday). Glad to share the good luck day with you. WINTER SUN and HEAVY CLOUD it is then Daisy. It is important I think to find yourself drawn to a work if it is going to be on your wall. I sometimes look at art I really truly appreciate and will look at again and again but I don’t want to live with. Also, thank you Daisy for your best wishes for the opening on June 30th! I already have the jitters as I get ads done and the invitations are in the works with the graphic designer. They’re all stunning but my favourite two are Henderson’s Hill & Owl View. 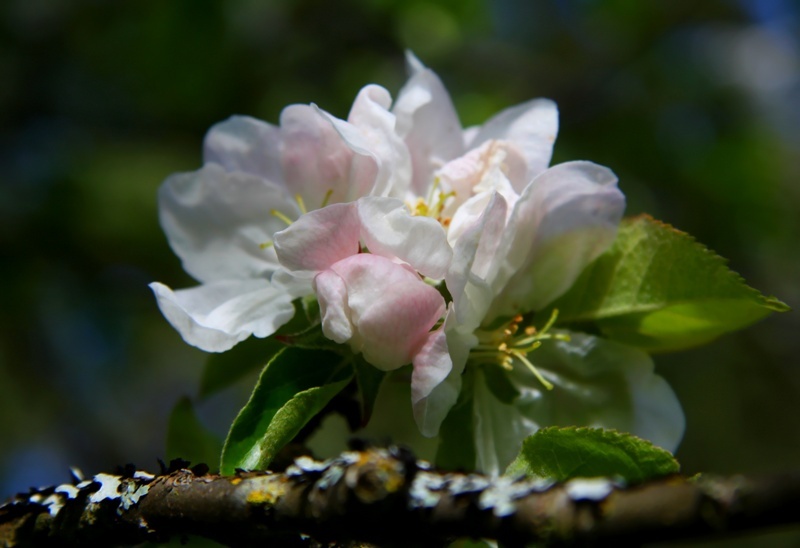 Gorgeous blossom – I love seeing the trees all dressed up in their beautiful flowers at this time of year! Thank you Katina on all counts! I am sustained. . . Apple Blossom #2 did it for me, it spoke to me in a language I’ve not heard in a while and all those seeds of impatience that have been stockpiled in my system for possibly lifetimes, just merely said (breathlessly) okay!! So, ya, I can wait for ‘Keeping Watch’. And mega kudos taking responsibility for shifting the ‘Friday the 13th’ paradigme from bad luck to good. . . .we needed that!! And F.Y.I. I don’t know if it’s you’r influence or if the BLUE vibe is just what’s up rite now but I have taken to painting in varying shades of blue only (which I never do, prefer reds and oranges) . . . . and it feels reallllllllllllllllllllllly good!! Alison I can imagine you with WHISPERING on your wall too. Unfortunately, the original has already sold but as I have said to others, cards and prints are still available. But for window shopping here on Creative Potager we can which ever one we want and no purchase is necessary! If you have any of your BLUE paintings ready to share Alison it would great to have a link so we can all come have a look. Just a thought. No pressure. Dear readers, you may want to stop by Alison’s blog and read her post “Show up, Listen & Engage – Stop Marketing (the old way)” It is an outstanding post that I am sure you will appreciate. Once again I find myself again on the same page with Laurie Buchanan. Ha! 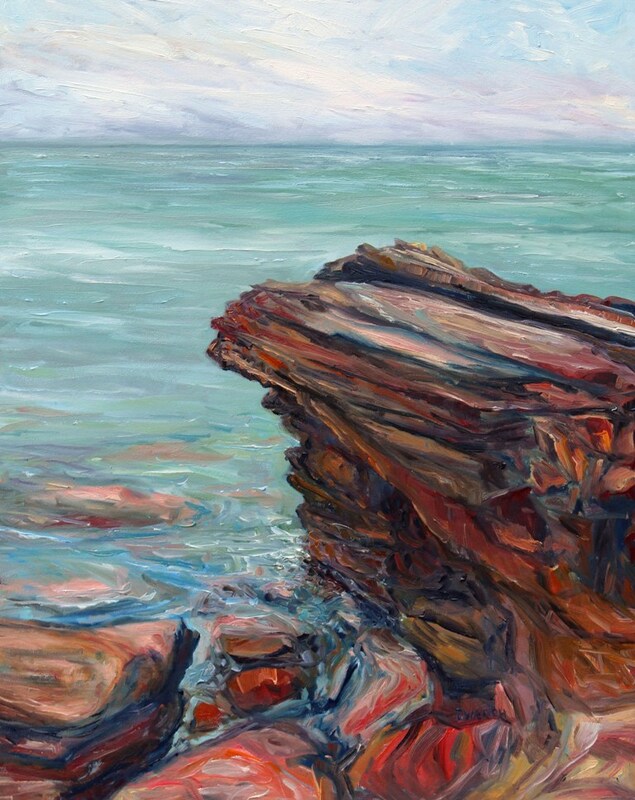 I love every painting in STUDY OF BLUE, but “East Point Cliffs” is the one that captures my imagination the most, as it’s an atmospheric reference to Peniston Crag in Bronte’s WUTHERING HEIGHTS. And I envision one day that your collection will be sitting in an art gallery with Miles Davis’ stark “Kind of Blue” serving as the backround music. Now wouldn’t that be the perfect match! 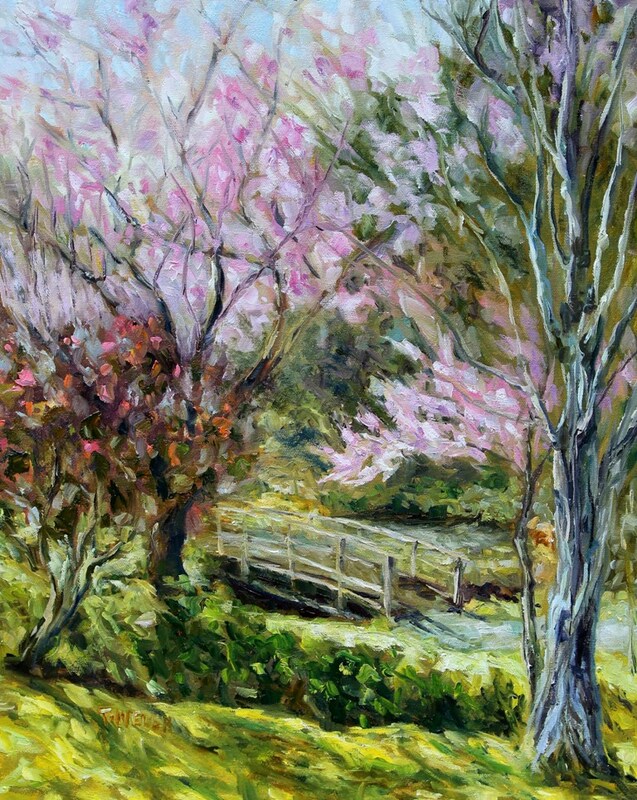 The pink cherry blossoms (well known in Japan) go perfectly with your apple blossoms! BTW, Ichikawa’s film will be out on a beautiful blu ray and DVD in July. 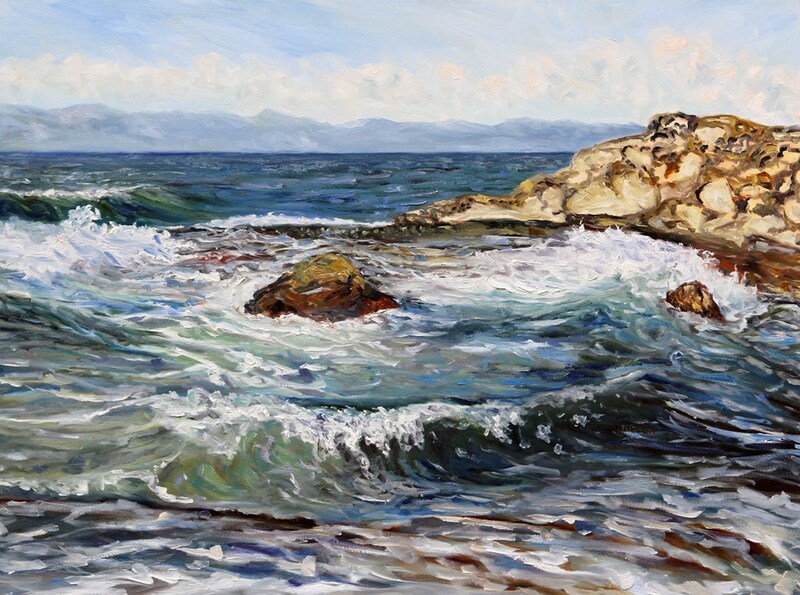 The two buyers who wound up with “Heavy Sea” and “Orange Cloud” are exceedingly fortunate. I’m sure these beauties will be appreciated for decades to come! 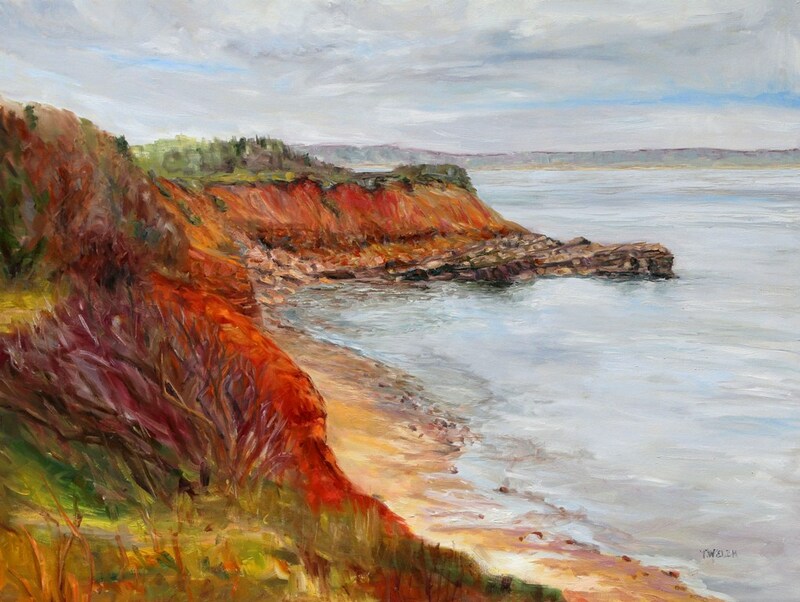 Sam, I think that you and Laurie would find EAST POINT CLIFFS very much to your liking… I mean the real ones as well as the painting. And Sam I like how you envision things. It would be lovely. I will have to see if we can order “The Makioka Sisters” as it seems like it would be a perfect fit for our viewing tastes.